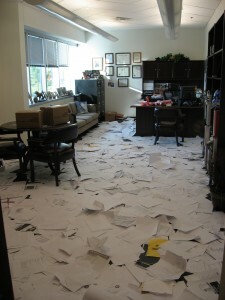 Oh Tina, I have been SO disorganized lately! I saw this article this morning and thought someone must have called you and complained. I just now finished three things that should have been done two weeks ago. My desk is sparkling clean, but without the hour glass that I’ve had there for two years that was always toppling over. I do feel better, I really do! Have a great week! P.
I’ve noticed the same thing about this time of year. I blame it on waiting for football games, talking about football games and debating about players and coaches. If you don’t watch football I don’t know what your excuse would be, I guess then you’re just being lazy. Anyway, I did clean up my desk as ordered and you’re right, it helps. I just did this exercise and found it useful. But,it seems to me I just did it as a New Years activity too! I liked the three item project and cleared that up before noon. Relief! There are times when the clutter in my head is even worse than clutter on my desk. That is the time to do something similar to your suggestion here: I take the time to make a list and prioritize my tasks so that I don’t feel overwhelmed. Having said that, I do agree that a clutter-free desk helps tremendously too. OK, I needed this. I get such Spring Fever in the Fall! I don’t want to work and nothing seems to come together right. But, just now I cleaned off my desk top and organized some things, so maybe that will help. Actually, what I did was tell everyone else that they were going to join me in cleaning up their work areas so we could all get focused. I’m looking at a bunch of clean desks right now! Taking a few minutes every day to straighten up my desk, right before I leave, really works for me. I force myself to do it, no matter how much I want to keep working. The last ten minutes of the day is my winding down time and I have done that for years and found it to be a good way to keep things oragnized and also to get me out of the door on time. I had to go to the office today and decided to organize things while I was there. I hate to admit it, but I’m a little bit jazzed about getting to work tomorrow now that everything is where it’s supposed to be. I even did the three things you told me to do. Thanks, Ms. Rowe!